Meizu is about to announce a brand new smartphone called Blue Charm. This should be introduced on December 23, and we already saw some leaked images that showed its back. Now, a couple of new photos allow us to see more of the Meizu Blue Charm. The first new leaked photo lets us take a look at the handset’s front side. We can see that this is a dual SIM device running Flyme OS - the same Android KitKat ROM that’s found on Meizu’s MX4 and MX4 Pro. The second photo shows the rear of the Blue Charm in… blue. Meizu is seemingly going for an iPhone 5c look here (in the past, the company wasn’t afraid to seek inspiration from Apple). It’s said that the Meizu Blue Charm features a 4.6-inch, or 4.7-inch display with 1080 x 1920 pixels, a 64-bit MediaTek processor, 2 GB of RAM, and 16 GB of internal memory. A Blue Charm Note is also expected to be announced by Meizu. This one should sport a larger, 5.5-inch display. 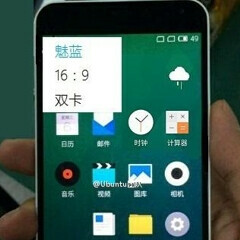 Both handsets should cost less than $200, being Meizu’s answer to Xiaomi’s Redmi 1S and Redmi Note. We liked the Meizu MX4 when we reviewed it in October, and the Meixu MX4 Pro is getting a lot of attention (at least in China), so we’re looking forward to seeing what the Meizu Blue Charm series can bring.